Photosynthesis is a fundamental biological process by which plants use light energy for growth. Most life forms on Earth are directly or indirectly dependent on photosynthesis. 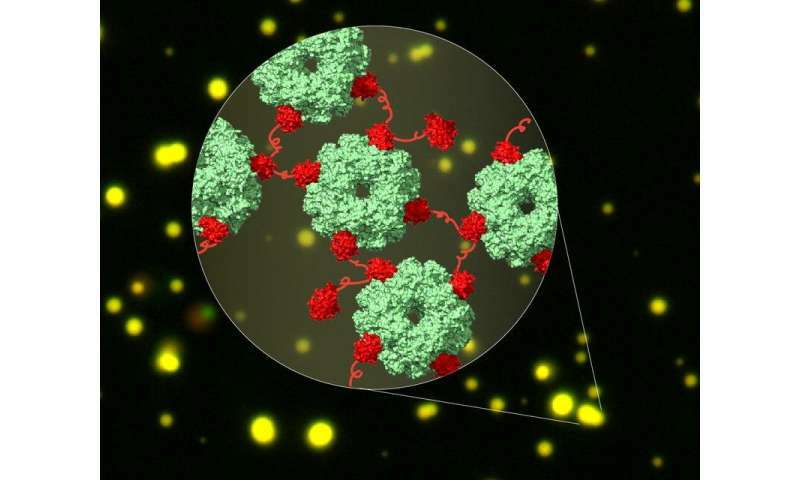 Researchers at the Max Planck Institute of Biochemistry in Germany have collaborated with colleagues from the Australian National University to study the formation of carboxysomes, a structure that increases the efficiency of photosynthesis in aquatic bacteria. Their results, now published in Nature, could lead to the engineering of plants with more efficient photosynthesis and thus higher crop yields. With the global population increasing by an estimated 80 million people each year, the demand for food is steadily rising. To meet this demand, scientists are working on strategies to improve the productivity of crops. While most organisms have to take up nutrients to generate energy for cells, plants and some microbes can fuel their cells with light energy. Via photosynthesis, they convert water and carbon dioxide (CO2) to sugar and oxygen with the help of sunlight. The critical enzyme of this reaction is rubisco, which catalyzes the fixation of CO2 from the atmosphere. However, rubisco, which is estimated to be the most abundant enzyme on Earth, works slowly and inefficiently. Instead of binding CO2, rubisco can also react with oxygen. Much energy is lost in this side reaction. Therefore, scientists are trying to engineer a more efficient version of rubisco to improve plant growth. A team led by Manajit Hayer-Hartl has now made an important contribution to these efforts. Cyanobacteria use a helper protein called CcmM to capture rubisco. CcmM is built of several repeat modules that resemble the small subunit of rubisco – therefore, it has been long assumed that these modules replace the small subunits of rubisco when the proteins interact, thereby linking rubisco proteins. However, the complex between CcmM and rubisco is highly dynamic and therefore could not be solved by traditional structural biology methods. "In this study, we took advantage of the rapidly developing method of cryo-electron microscopy to capture these dynamic interactions," says Huping Wang, shared first author of the study. Using cryo-EM, the researchers showed that CcmM does not replace the small subunit of rubisco but rather links rubisco proteins together by an unexpected mechanism. The interaction between CcmM and rubisco causes de-mixing of the protein complex from other proteins in the cell. "This de-mixing of proteins is called phase separation, a process that concentrates proteins locally. In cyanobacteria, the protein shell of the carboxysome is then formed around the phase separated CcmM and rubisco to capture them," explains Xiao Yan, shared first author of the study. A similar process of phase separation also plays a role in neurodegenerative diseases such as amyotrophic lateral sclerosis. The formation of carboxysomes boosts photosynthesis because these microcompartments concentrate CO2 in the vicinity of rubisco, making the enzyme more efficient. The results of the new study greatly improve the understanding of how these CO2-concentrating structures are formed. Manajit Hayer-Hartl describes a potential application of the results of the study: "If we could transfer functioning carboxysomes into higher plants, this would give crops an extra boost by allowing them to fix CO2 more efficiently. The energy, which is usually lost in the reaction of rubisco with oxygen, would go towards the production of biomass." In the long term, the insights from Hayer-Hartl's research could contribute to the generation of more efficient crops, reduce the demand for fertilizers and improve the global food supply.